Winner of the Hugo and Nebula Awards: A futuristic masterpiece, “perhaps the most important war novel written since Vietnam” (Junot Díaz). In this novel, a landmark of science fiction that began as an MFA thesis for the Iowa Writers’ Workshop and went on to become an award-winning classic—inspiring a play, a graphic novel, and most recently an in-development film—man has taken to the stars, and soldiers fighting the wars of the future return to Earth forever alienated from their home. Conscripted into service for the United Nations Exploratory Force, a highly trained unit built for revenge, physics student William Mandella fights for his planet light years away against the alien force known as the Taurans. “Mandella’s attempt to survive and remain human in the face of an absurd, almost endless war is harrowing, hilarious, heartbreaking, and true,” says Pulitzer Prize–winning novelist Junot Díaz—and because of the relative passage of time when one travels at incredibly high speed, the Earth Mandella returns to after his two-year experience has progressed decades and is foreign to him in disturbing ways. Based in part on the author’s experiences in Vietnam, The Forever War is regarded as one of the greatest military science fiction novels ever written, capturing the alienation that servicemen and women experience even now upon returning home from battle. It shines a light not only on the culture of the 1970s in which it was written, but also on our potential future. 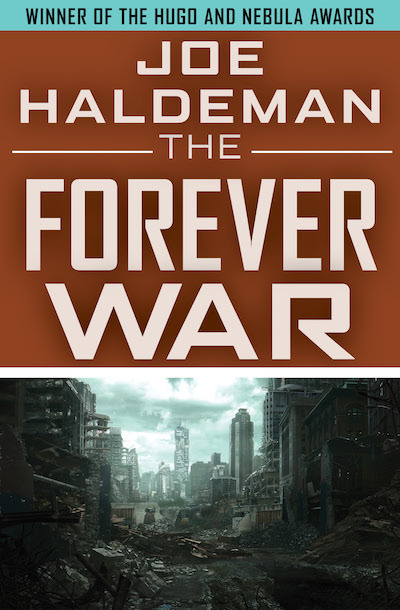 “To say that The Forever War is the best science fiction war novel ever written is to damn it with faint praise. It is . . . as fine and woundingly genuine a war story as any I’ve read” (William Gibson).